Gas works were erected in 1840, at the cost of £1500, raised in £5 shares. In 1842 the recently reconstructed works were advertised for letting by tender. According to the particulars, a 'moderate' amount of coal produced 'excellent' gas, and the by product of coke could be easily sold. The gas was used to light lamps in the town, which provided an income. J Caunter chaired a meeting in September 1843, to decide the amount of money to be paid by the parish for Lighting the Town Lamps. Many of the yeoman objected to having any light at all. 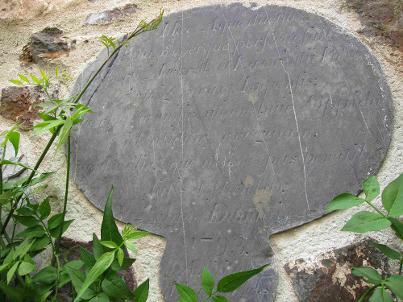 John Cooke, born at the Rose and Crown in 1765, later moved to Exeter and became a well known eccentric there. (See Inns and hotels). 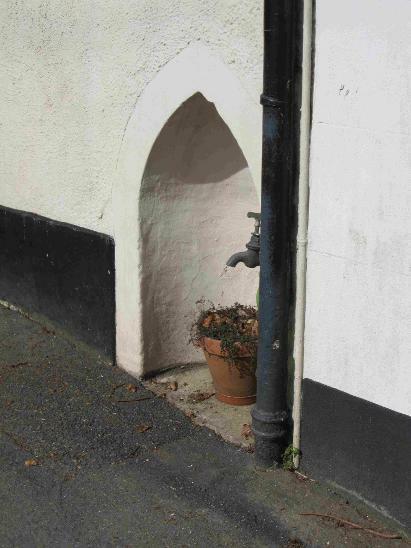 According to Sabine Baring-Gould, he claimed his grandfather brought water into the town to the East Street conduit. In 1793 Sir Lawrence Palk and Sir Robert Mackreth, Members of Parliament for Ashburton, had an aqueduct built in the town. This plaque, hard to read and in Latin, commemorates its construction. Above: Plaque in a garden off West Street. Many thanks to the owners (who wish to remain anonymous) for permission to photograph this item. 1854 John Sparke Amery, 'always interested in any public good', offered residents the use of spring water from any of his fields. Water was, said the Western Times, 'now so much wanted'. In May 1855 there was a proposal for a sewer in East Street. Many people believed that a sewer was unnecessary, and thought a good supply of water was more of a priority. Later that year there was a shortage of water in the East Street Conduit, resulting in its being turned off at night. Shares had been issued in a company proposing to the improve the water supply, but nothing had come of it. In 1856 the Western Times was able to report that sewers were about to be installed in East Street and North Street. The paper suggested that the next improvement must be to have a better water supply. In 1869 the same newspaper was able to report that in spite of extraordinary weather conditions the streets of Ashburton had no surplus water, thanks to the complete sewer system. 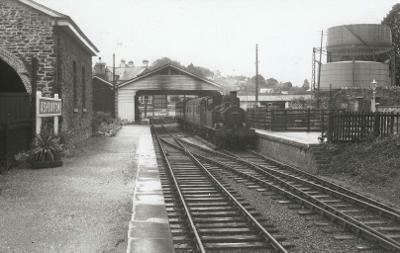 * 'Even in the 1950s tomatoes grew beautifully along by the railway tracks.' Ashburton resident. In 1866 Mr Jardine, MP for Ashburton, installed a water supply to the town from his own estate. 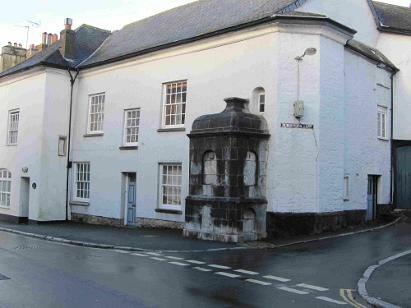 Left: Water conduit, corner of East St and Roborough Lane. In the dry summer of 1870 'Jardine's Water Works' proved invaluable, but the Western Times complained of waste. The newspaper said that Mr Jardine had certainly never intended that the water be used for activities such as watering gardens, or used in industries such as brewing, or the Gas Works. 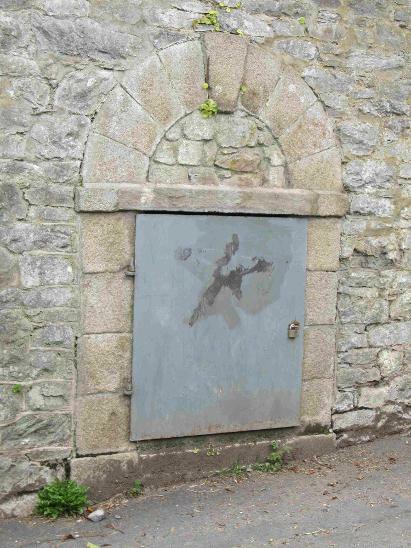 John Satterly, born in 1879, said that "every boy deemed it his duty to hurl a stone at the door..."
Right: Door to a water cistern, Roborough Lane. In 1884 this was still the main source of water, but it was a low-pressure supply brought through cast iron pipes to conduits and public taps, mainly in the bottom of the town. What the ratepayers now wanted was a supply that would work water closets and fire hydrants, and be of sufficient pressure to reach the upper floors of houses. 1925 A letter had been received by Ashburton Urban District Council from Messrs Carter and Fisher saying that their client was still waiting for the Electricity Commissioners' decision regarding the Ashburton electricity scheme. 1938 There was unanimous condemnation by the Urban District Council on the charging structure for electricity imposed by Torquay Corporation. When the price in Ashburton was a penny per unit, it was a halfpenny in Torquay and Newton Abbot.